Overall, at 3.5 out of 5 stars, Dr. Mercola Complete Probiotics is a pretty good product. It has 70 billion CFUs, which is an extremely high number. The high cell count makes it a possible option for a specific ailment (but probably not the best choice for a daily use probiotic). And you probably don’t want to take this one for too long. I was taking a round of antibiotics while taking this supplement, so it was perfect timing since I was in need of the extra probiotic boost! This probiotic also has a good variety of 10 probiotic strains that help with immune and digestive support. I also like that this probiotic is very allergy friendly and doesn’t contain soy, milk, yeast, gluten, nuts or eggs. This probiotic is stable for up to 2 years when stored in a cool, dry place. However, refrigeration is recommended to keep the cells at maximum potency but it’s not required. What I don’t like about this product is that the cells are only guaranteed at the time of manufacture. I like it better when products are guaranteed until the expiration date, but at least the higher cell counts mean you have a better chance of still getting a higher dose than you would from an average probiotic. You do have to take 2 capsules daily, preferably in the morning, so that is something to keep in mind. Also, the probiotic is recommended for adults 18 and older. I would’ve like to see the price be a little cheaper, however I do think it’s a good value for being such a potent probiotic. Overall, I think Dr. Mercola Complete Probiotics is an above average probiotic that could be a great choice for a specific ailment since it has 70 billion cells, 10 probiotic strains and is allergy friendly. Some of the only downsides are that the cells are only guaranteed at the time of manufacture, it’s not safe for kids, and it’s a little more expensive than average. Dr. Mercola Complete Probiotics contain 70 billion CFUs in 10 different strains. Of note, I like the use of Lactobacillus acidophilus, which has been researched quite a bit and is commonly used in probiotic supplements. I also like the addition of Bifidobacterium bifidum in the strain profile. Bifidobacterium bifidum has been shown to help boost immune function and balance out the bacteria levels within the body. This particular strain has also been researched to show a potential decrease in inflammation, lessen allergies, and help fight off E. coli infections. Dr. Mercola Complete Probiotics are very allergy friendly. They don’t contain any major allergens such as nuts, lactose, dairy/milk, casein, yeast, or eggs. The capsules are also gluten free and soy free. They also don’t contain any animal by-products. The other added ingredients include: vegetable cellulose, microcrystalline cellulose, Fructooligosaccharide (FOS), and silicon dioxide. For a 60 capsule bottle, lasting 1 month, it costs $29.97. This works out to be $0.99 per day to take these, since the recommended dose is 2 capsules daily. Anything over a dollar a day is definitely on the pricier end. However, this probiotic is worth the slightly higher price because of its high CFU count. I think it ends up being a good value for the price when dealing with a specific ailment. I did get side effects when first taking Dr. Mercola Complete Probiotics. For the first 2-3 days, I experienced some belly pain. 70 billion CFUs is way above the average and probably overkill. If you have a sensitive stomach, be sure to ease into these supplements. However, after the first few days, the side effects went away and my belly felt great. Dr. Mercola Complete Probiotics has a 60-day money back guarantee. You can get a full refund (minus shipping charges) if the product is at least half full and in the original packaging. Dr. Mercola also offers a lifetime satisfaction guarantee. If you want to return a product after the 60 days, as long as it’s at least half full, you can receive store credit (minus shipping fees). Having the product be half full is a bit of a stipulation, but I really appreciate the company for offering both of the guarantees. 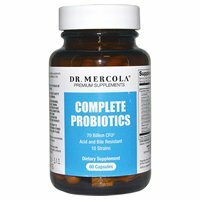 To buy Dr. Mercola Complete Probiotics, click here.